During a meeting with former Lebanese Prime Minister, Fouad Al-Sanioura, Egypt's Grand Mufti, Shawqi Allam, refused to call the Jihadist group in Iraq as the Islamic State. Allam stated that the group does not represent Islamic values ​​or law, state news agency MENA reported. Allam met on Tuesday with Al-Sanioura to discuss the criminal acts of the previously known Islamic State of Iraq and Levant (ISIL) – also known as Daesh – against Iraqi Christians and others. Allam also highlighted that their crimes are a shame to Islam and Muslims, and that regional and international cooperation is needed to fight such groups. In mid-July, thousands of Christians in Mosul fled after the Islamic State gave them an ultimatum to convert to Islam, pay jizya (protection money), leave or risk death. The exodus raised concern throughout the international community, and neighbouring countries began to accept the fleeing Christians as refugees. Mosul has been under insurgent control since June, but there have been hit and run attacks by government forces and allied Kurdish peshmerga fighters. Inl Baghdad on Wednesday, car bombs exploded in crowded markets in Shi'ite Muslim districts, killing at least 10 people, police said. 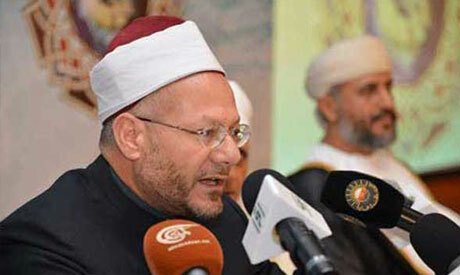 Why this mufti dos't want to speak against Egypt jenocide ?what happend in rabia aladavia?what hepning in Egypt? He know only about isis in iraq ?what about almaliki ?maliki killed thousand sunni childrens..this mufti getting salarry from govt and speaking for govt. When the illegitimate coup regime in egypt massacred thousands of innocent Egyptians where was this so called grand mufti.....he was totally silent when these atrocities were being committed in Egypt. This grand mufti's silence brought "shame to Islam and Muslims". It is a great relief to read that a Muslim leader is standing up and stating that IS do not represent Islamic values. I imagine that this could be a dangerous statement to make publicly, and so I am very grateful for Allam's courage. The brutality is shocking, worse than anything I can think of in known history. I am sure that those involved will eventually feel remorse and shame. And I am also sure that any state started on these terms is doomed to fail the people it governs. There will ultimately be power struggles and brutality against one another within this barbarian culture. I am curious to know what 'psychological tricks' are being used to turn people towards such extreme, inhumane behaviour. I sincerely hope we will hear more prominent voices decrying this group, and that we as an international community can stem their spread.